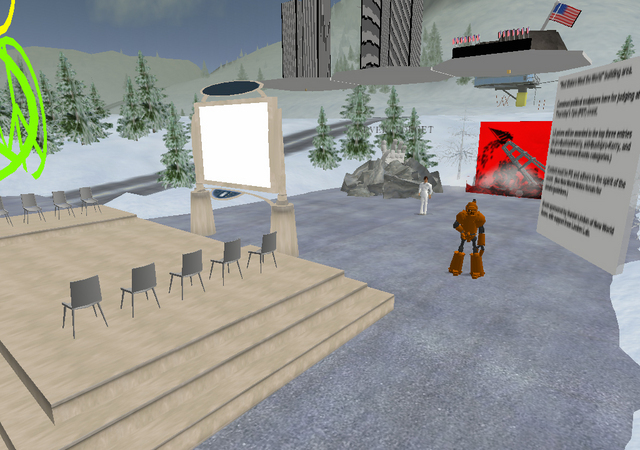 New World Notes: RED STATERS MEET THE WORLD: SETTING THE STAGE! RED STATERS MEET THE WORLD: SETTING THE STAGE! If you're a resident and you still feel like talking about the Presidential election, you should stop by the outdoors auditorium near the winter chalet in Wengen (75, 248), tonight at 7pm (PST). That's where I'll be hosting "Red Staters meet the World", a NWN event bringing passionate Bush supporters-- primarily from the mid-West and Southern "red states"-- together on stage with equally passionate Bush opponents from the "blue states", and from outside the US. Not a debate, one hopes, but frankly, a chance for both sides to try and figure each other out. When I arrive at Wengen this afternoon, to check the stage, it's already ringed by four sculptures. There's a triptych memorial to 9/11's terrorist attack on the World Trade Center, and a mural based on the famous World War II photo, of U.S. troops raising the flag at Iwo Jima-- but here, instead of raising the American flag, the soldiers are raising an oil rig. Nearby, a bronze robot is putting the finishing touches on another 9/11 memorial, featuring a battered hand emerging from the rubble. At the end of the event, I'm giving out prizes to political builds like these, in three categories: anti-Bush/pro-Kerry, anti-Kerry/pro-Bush, and Non-Partisan Current Events. Of course, in these partisan times, even deciding what qualifies as non-partisan can be a challenge. "Hmm," I muse to Peredur Vindaloo, "does your peace sign tower count in the anti-Bush category, I guess?" "Until Falluja," Vindaloo replies, heatedly, "I would have said no. Today I'm less neutral. To be honest, I will let the reds decide whether they wish peace signs to be on their side or the opposition." So she agrees to qualify her tower of peace symbols as anti-Bush. In four and a half hours, I'm guessing that they'll be even less neutrality at that site. But hopefully more understanding, too.